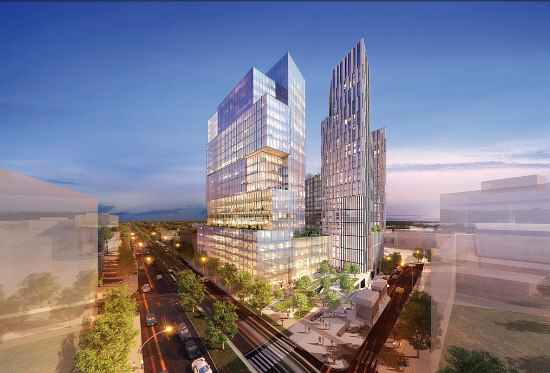 Today, UrbanTurf continues our annual update on the DC region’s residential development pipeline, heading up Wisconsin Avenue to downtown Bethesda. 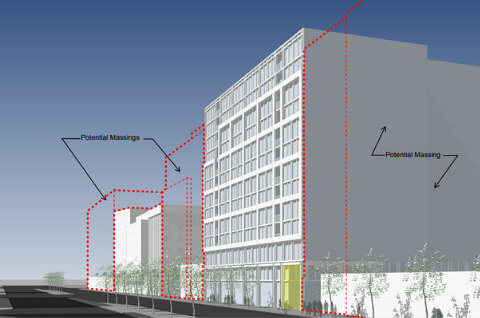 Downtown Bethesda is faced with a few competing dynamics: development in some portions of Bethesda may be slowed by an ongoing development moratorium currently in place as Montgomery County contends with school overcrowding, while some projects are upsizing to take advantage of the downtown Bethesda sector plan’s density allowances. Below, we take a look at what is still on the boards and on-track for near-term development in the area. Last November, the Montgomery County Planning Board (MCPB) approved a preliminary plan application that the Auburn Building Association filed for the mid-century office building at 4915 Auburn Avenue (map). The plan is to raze and replace the structure with one roughly 175 feet tall, delivering 160 residential units above up to 12,500 square feet of commercial space. 15 percent of the apartments in the Shalom Baranes-designed building will be set aside as moderately-priced dwelling units (MPDUs). Now, the development team is gearing up to file a site plan application to the county this spring, with hopes to be granted planning board approval in the fall and begin construction work next year. Last October, MCPB approved a preliminary plan amendment the Lenkin Company filed in order to enlarge its previously-approved development at 4922 St. Elmo Avenue (map). Now, the two-story office building at the site is expected to be replaced with a 225 foot-tall, 330,000 square-foot building containing up to 245 apartments and up to 16,000 square feet of commercial and office space. 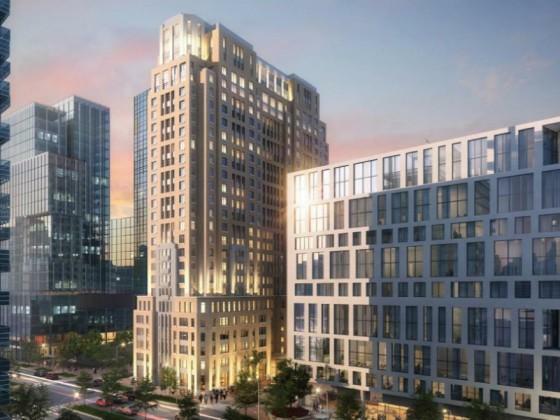 MPDUs will comprise 15 percent of the residential stock, and a 30 foot-wide paved promenade will separate the building from the adjacent Bainbridge Bethesda and feature a seven foot-tall translucent sculpture by Spanish artist Jaume Plensa. The project will also be serviced by 230 parking spaces on four below-grade levels. David M. Schwarz Architects furnished the design. Equity Residential acquired permits earlier this year to begin work on the second component of the Edgemont Bethesda at 4885 Edgemoor Lane (map). The new construction would deliver 160 apartments across a 15-story building with ground-floor commercial space; 15 percent of the apartments will be MPDUs. There will also be 74 parking spaces across two below-grade levels in the SK+I Architecture-designed building, and the project will also deliver 2,957 square feet of public space. The MCPB approved a site plan application in January for a mixed-use development at the former site of the La Madeleine restaurant at 7607 Old Georgetown Road (map). 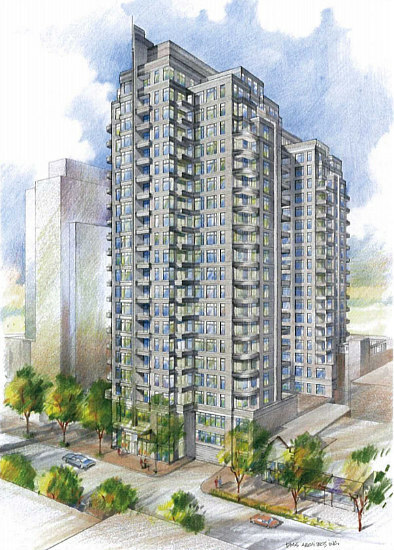 Washington Property Company plans to deliver another Solaire-branded property, this one rising 225 feet tall with up to 200 residential units above up to 2,700 square feet of retail. Construction could begin as early as this summer for delivery in 2021. 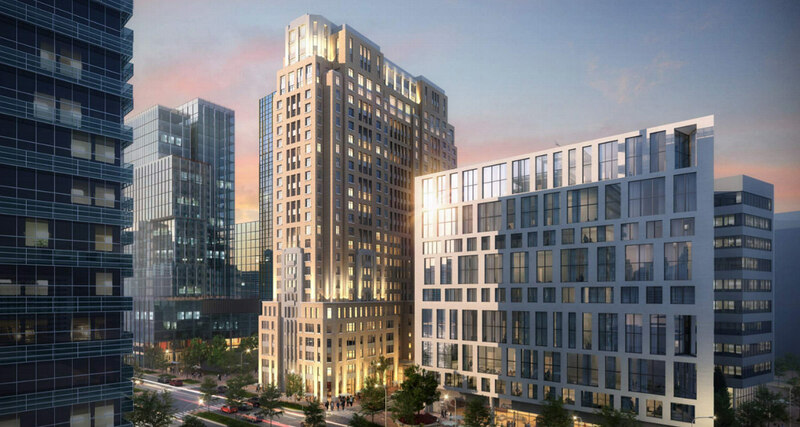 Brookfield Properties confirmed in February plans to move forward with a mixed-use residential development at 4 Bethesda Metro Center (map). The resulting building is expected to have a maximum height of 290 feet and deliver up to 600 residential units atop ground-floor commercial space. At least 15 percent of the residences will be MPDUs and the project will also include improvements to the Metro station and a roughly 42,000 square-foot public plaza with a Central Lawn and retail-lined promenade. Woodfield Development and Starr Capital just filed a sketch plan application to replace the commercial strip surface parking lot at 6936-7000 Wisconsin Avenue (map) with up to 200 rental units above up to 15,000 square feet of commercial space. Roughly 36 of the apartments will be MPDUs, and the project will also have 120 parking spaces across three below-grade levels. The development team is aiming to bring a movie theater back to the neighborhood, permitting construction of a building roughly 132 feet tall. The theater would occupy 4,000 square feet of the commercial space. SK+I Architecture is the designer. Construction began last August at the former site of the Apex building and future site of Bethesda’s Purple Line stop at 7272 Wisconsin Avenue (map). Carr Properties will deliver a 295 foot-tall development, creating 360,000 square feet of office space, 14,572 square feet of retail and 460 apartments, 60 of which will be MPDUs for those earning up to 70 percent of area median income. Shalom Baranes is the architect for the project, which will also deliver 7,500 square feet of open public space and 750 parking spaces both below and above grade. Fox 5 will relocate to 58,000 square feet of the office space at The Wilson starting in the second quarter of 2021. The MCPB approved a sketch plan application for the Montgomery Pearl in January 2018; however, things have seemingly stalled since then as a preliminary plan still hasn’t been filed. 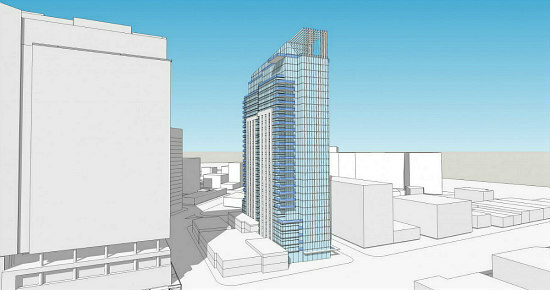 Promark Partners planned to construct a 175 foot-tall residential-over-retail building at 4540 Montgomery Avenue (map); no parking is planned for the project. 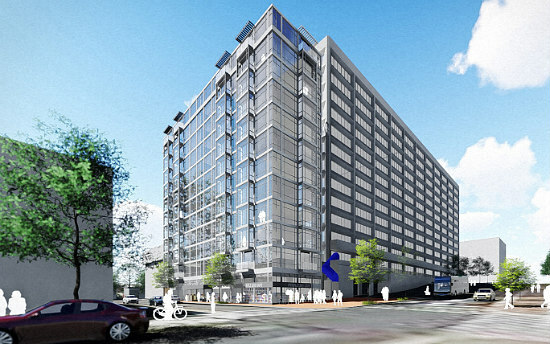 A sketch plan application is pending for the Metro Tower development, which would replace the existing office and commercial buildings and parking garage at 7316 Wisconsin Avenue (map) with a 250 foot-tall mixed-use building. Owner Saul Centers plans to deliver 390 residential units above 11,000 square feet of commercial space. 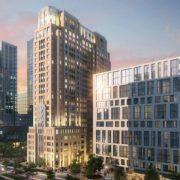 Fifteen percent of the apartments in the Torti Gallas + Partners-designed building would be MPDUs. 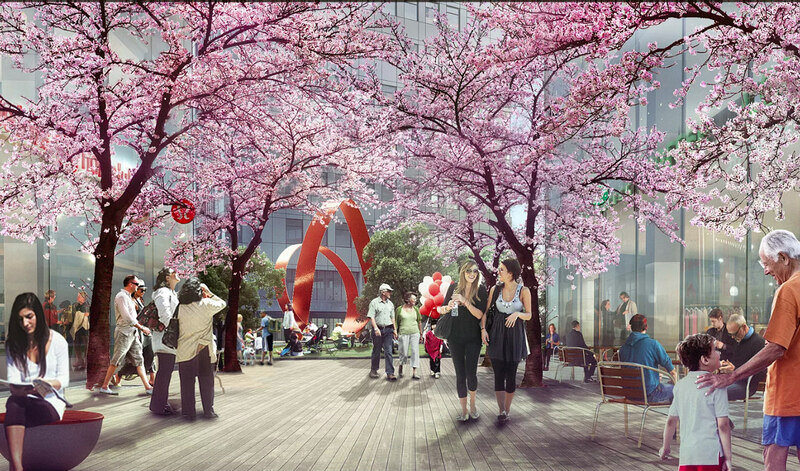 The project would also enlarge the adjacent public plaza from 4,672 to 9,183 square feet. 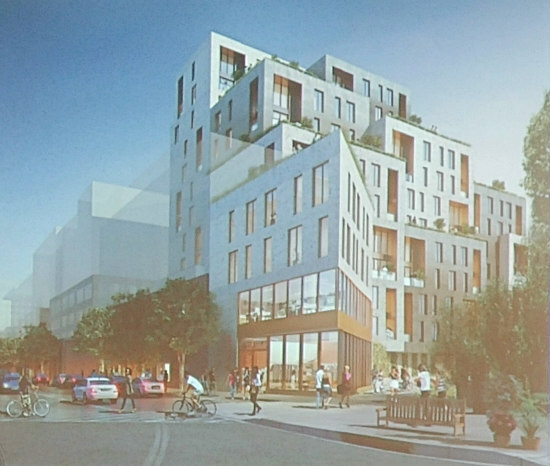 The county has yet to receive a sketch plan application for the development previously teased at 7820 Wisconsin Avenue (map). 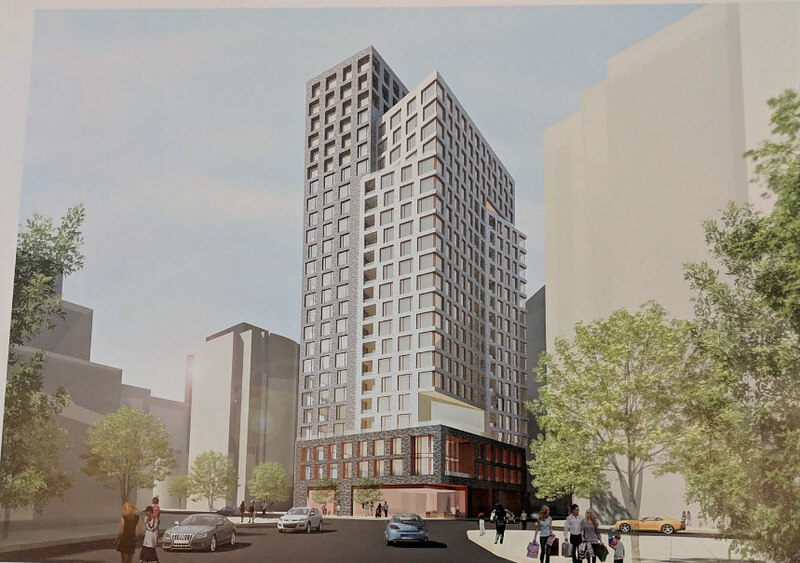 As of last February, developers Bethmont and Bethesda Land were looking to replace the 7-Eleven and Eagle Bank with a 30-story mixed-use project containing 319 apartments above 9,000 square feet of ground-floor retail. 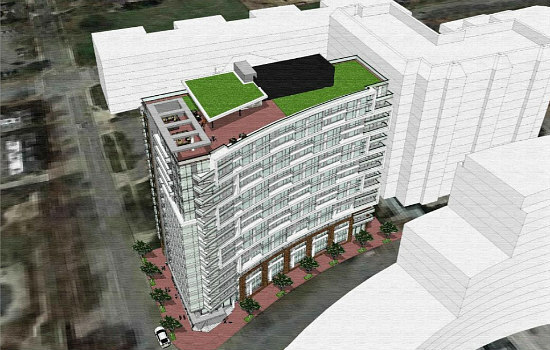 Eighty of the apartments would be MPDUs and there will be 150 below-grade parking spaces. The skeleton of the 17-story building planned at 7900, 7909, 7924 and 7934 Wisconsin Avenue (map) is already several stories high. 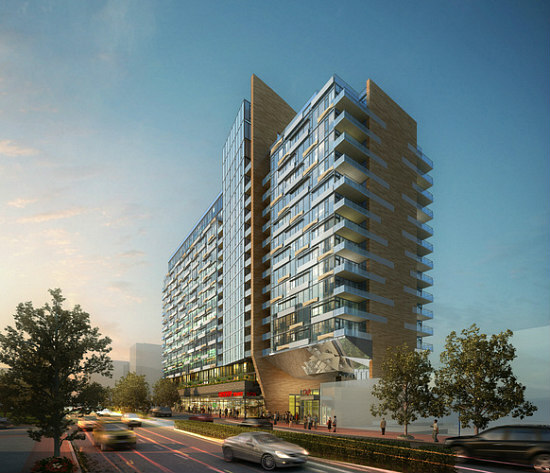 The JBG Smith-helmed development is anticipated to deliver 450 apartments above 19,600 square feet of commercial space which could include a 12,000 square-foot grocer. Baumberger Studio designed the development, which will also deliver an 11,000 square-foot two-level park. 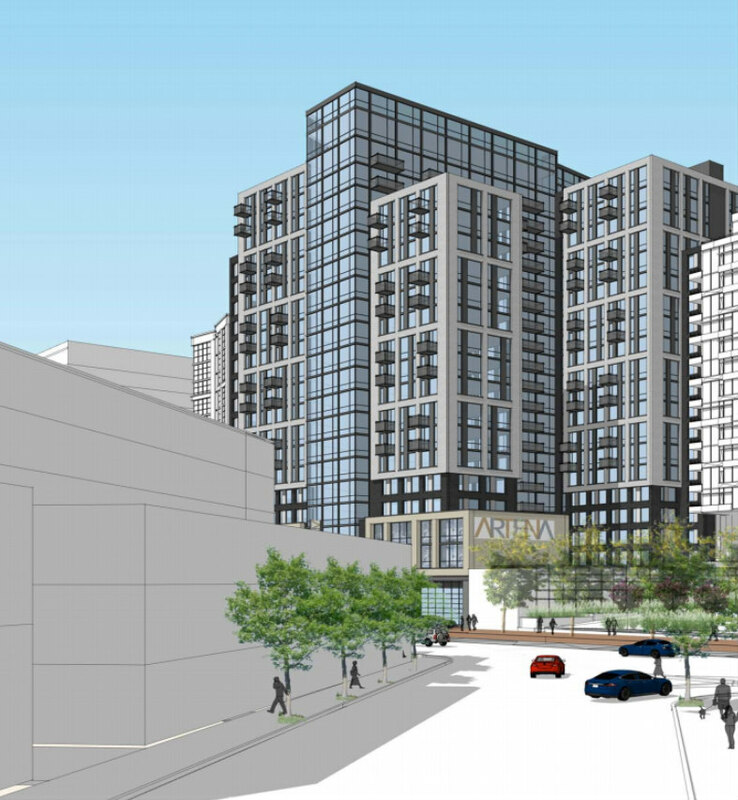 A sketch plan was approved last May for The Artena, a project which would deliver 441 residential units and over 20,000 square feet of commercial space at 8000 Wisconsin Avenue (map). The building will have a three-story base with residences split between a 14-story volume fronting Woodmont Avenue and a 19-story volume fronting Wisconsin Avenue. One-quarter of the apartments will be MPDUs. A garage entrance on Woodmont Avenue would provide access to 64 bicycle spaces and 312 vehicular spaces. Aksoylu Properties is helming the development team and SK+I Architecture is the designer. The project is expected to be complete in 2021. 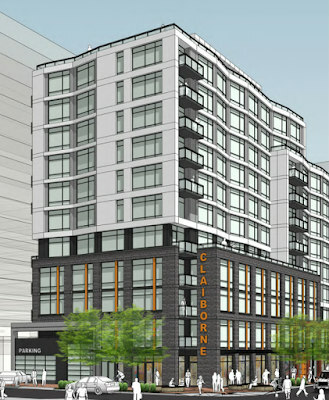 Toll Brothers City Living received approval in 2016 to construct a 14-story building at 8008 Wisconsin Avenue (map) with 106 condos (including 16 MPDUs) atop 5,793 square feet of retail. However, the plans seem to have stagnated since then. Novo Properties and DBT Development Group received MCPB approval in February for a mixed-use development that will replace the former Steamers Seafood building at 4820 Auburn Avenue (map). The resulting 110 foot-tall condo building will deliver 84 condos over 5,000 square feet of commercial space and 48 parking spaces. Up to 13 of the units will be MPDUs. The project could break ground this fall and deliver in 2021.